I am shocked! Those mushrooms have zero understanding of caution. Ha ha ha! That is the cutest little group of crochet creatures ever!! I seen a mushroom in my back yard not long ago. I'm going to need to keep a close eye on it from now on. They have so much character and are adorable! Love the cake as well! Sharona: Yes, they finally understood the meaning of caution for a brief, bright, terrible moment. PaisleyJade: They would have been happy to hear about your cute compliment, thanks! Kitty Ballistic: Yes, the third mushroom does look like a fun fungi! It was probably his idea to hold the surprise birthday party. Saffron: Yes, the tequila went straight to their mushroom heads! Eliz: Thanks for noticing the details :) I'm just glad the candle's flame didn't burn the cake during the photos! 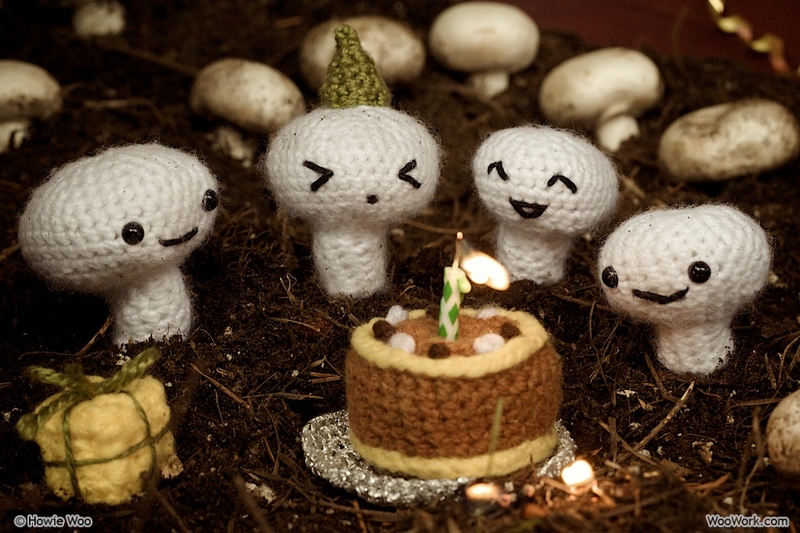 I love the mushrooms - they are really having a blast with the birthday celebrations, I just hope they survived the terrible fire afterwards. Fantastic stuff - especially that cake, it looks good enough to eat. Parteeeee!!! I LOVE IT !!! Birthday mushroom, it's all your fault! I see the little present in the corner too! Sooooooo awesome!! They may be a bit careless with flames but they do look like fun-guys (fungis). TADA's Revolution: hehe Yes, that birthday mushroom made it a doomsday for the others in the barn! :D Thanks for noticing the present! mochaxlight: Wow, your love of orange pop is so intense, it crossed into this older blog post! :D I'll dedicate my next orange soda-swig to you!